"For folks who don't like regular fruitcake." Our pecan fruitcake is made with a delicious HONEY-BUTTER-RUM batter that's loaded with whole pecan halves (25% by weight), candied pineapple, whole cherries, dates, and coconut. There is barely enough flour to hold everything together! You won't find cheap fillers like raisins, citron, or bitter orange peel. 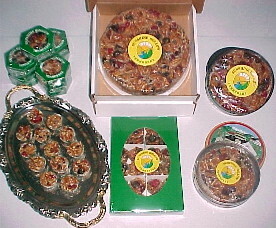 Unlike most other commercially available fruitcakes, Sunshine Hollow cakes contain so many whole pecan halves, large pineapple chunks, and whole cherries in the batter that they actually decorate themselves while they are baking. Our cake is so moist, many people think it is a no-bake fruitcake. Most are amazed that the cakes are in the oven over two hours. Pictured at left is our fruitcake lover's size, a full 64 Ounce Ring Pecan Fruitcake packed in a white gift box. This cake will serve a large group of relatives and friends. Our one and one half pound loaf is our most popular size and is available in a two pack or three pack for better pricing. The 5 ounce cake is perfect to put in your own gift basket or as a stocking stuffer or small gift. It is packed in a green six-sided box. This very popular item is a combination box with eight "Little Dazzlers" and Praline, Chocolate, Butterscotch, and Chocolate Toffee pecans. Packaged in a 24 ounce gift box. SLICING AND STORAGE TIPS: Our cakes are so full of pecans, cherries and pineapple that they should be frozen for best slicing results. Simply remove the cake from the freezer and cut with a strong sharp knife dipped in hot water. Our cakes keep best frozen. You may rewrap with a quality plastic wrap or aluminum foil or place the remainder back in its tin (with the lid on tightly) until you wish to slice more. Version: i, February, 2007. Page generated 10:14 EDT; Saturday, April 20, 2019.